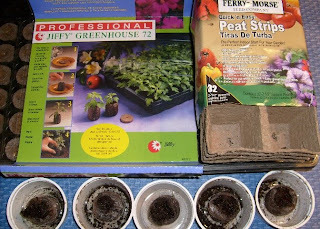 The pic to the right shows our seed starting supplies: Jiffy Peat Pellets (the "greenhouse" and those we've watered and are awaiting seeds in yogurt cups) and Peat Pots (strips) that we used last year for corn - might use again later. We'll see. If you live in the Northern Hemisphere, it's time to start some of your vegetable crops indoors. Here's some tips to help you. Don't start seedlings too soon. They could become crowded and spindly which will hurt their survival chances when you can finally get them in the ground outdoors. Some of your veggies (and other annuals) do best when sown directly into the ground where they'll live their lives. Better wait for those until the weather is ready. Have you built a cold frame yet? If so, get started in that because that will give you a six-week head start! Seedlings started indoors or in cold frames should be "weathered" or "hardened off", which means you need to gradually introduce them to the outdoors. Nights will still be cold. Start start seeds four to eight weeks before the average date of last killing frost. Don't do it too soon or the seedlings will be thin and spindly and won't do well outside. We started our tomato plants yesterday (March 6) here in Colorado but since they'll be grown in pots because of our moving situation, we can bring them in if we ever actually get cold weather. Ha! PEAT PELLETS: We use the Peat Pellet system - we'll post an entry about this later today. Yes, we realize peat is a non-renewable source, but we're still somewhat beginner gardeners, and are still working with alternatives to find what's best for us. PEAT POTS: Again, non-reneable, but these little pots work well with transplanting. Fill the little pots with potting soil, place in a dish or something to catch the water, lightly moisten the soil, add a seed, label (!!! ), and watch. Moisten regularly. When seedling comes out of soil, place in sun. When seedling is as big as the pot, ready to transplant! This is what we do for corn seeds, as it doesn't disturb the root when transplanting. YOGURT CONTAINERS: Almost any container with drainage holes in the bottom will work for planting. Paper milk cartons cut in half, Styrofoam cups, tin cans, yogurt containers, plastic trays and pots are common containers used. Again, fill with potting soil. Avoid using your garden's soil unless you've composted well, and you're sure the soil doesn't have weed seeds or anything else that can interfere with the maturation of your veggie/fruit/herb seed. TIP: Don't fill your pot or container to the top with potting soil. Remember, you need to keep the seed moist, so when you water, you want to make sure the water doesn't run off, taking some precious potting soil with it. Using a mister is best. TIP: Place seeds in the potting soil according to the seed's directions. Good rule of thumb is the size of the seed is exactly the amount of depth you should plant it - cover no more than four-times the diameter of the seed. For instance, lettuce and other greens seeds are very very small so place the seed on top of the soil and just VERY lightly, dust potting soil on it. TIP: Most places say "place two or three seeds in each pot" but when every one counts, I just place one seed. That way, I don't have to thin. I'd rather re-seed than thin, any day. TIP: Remember to water carefully and often. The seed needs to be constantly moist to germinate, and using small pots or pellets will dry out rather quickly. Check at least daily - when first starting I usually check at least twice a day because I'm constantly looking to see if we have any babies! HOWEVER, don't soak the soil because that could rot the seed. It's a fine line. TIP: Ready to transplant? About one week prior to planting-out time (remember to use your freeze-date guidelines), gradually expose your seedlings to longer and longer time outdoors. Except when temperatures are going to dip below 50 degrees. While exposing them to the outdoors, reduce watering to a minimum but don't let the seedlings wilt. Being careful with the seedlings at this point will help the bigger seedlings/plants adjust to full outdoor exposure without a lot of shock when you transplant them.